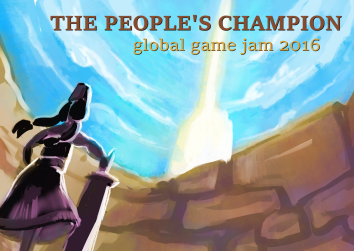 For those that don’t know, Global Game Jam is an event that takes place world wide where people gather to make a game in 48 hours. These people include artists, programmers, game designers, audio engineers, professionals and independents. Every year a new theme is chosen, it is revealed only when the Game Jam starts and is used as a catalyst for creative designs. Once teams have decided what they are making they have the rest of the 48 hour period to make the game. Sounds simple right? Hehehehe….. I used Surviving in the title for a reason. When I say you have 48 hours to make this game I mean more like 42 hours because of the difference in start and end times. That is cut down to about 40 because of introductions, team creation, and brainstorming. Then you will probably take about an hour to set up your equipment. The idea for your final product WILL change (mostly because of over-reaching in initial idea or just cool new ideas). Then you have to factor in food and sleep. And different people have different schedules and limits for those things. So now you are down to about 30 hours. Then inevitably people will be waiting around for something else to be finished or given work that turns out was pointless. Also your equipment WILL have some sort of problem (Murhy’s Law). So yeah, simple premise, difficult execution. Also if you have been doing the math I only allotted about 8 hours for food and sleep, about 2-3 of which are for food runs and such. Yep, say goodbye to sleep if you want to get this done. This last jam I slept twice, the first time for about 3 hours and the second time for about 5…. I think. So, what happened this year? The theme for this year was “ritual”. Lots of the ideas for this theme involved Satan, demons, or the never ending repetitiveness of your everyday lives as servants of society, I will let you decide which of these is scariest. My team went with an Incan theme for our game. The idea is that you are the strongest child of your village and must take part in ritual combat to prove yourself and attempt to ascend to god-hood. The game’s style is reminiscent of classic beat-um-ups like golden ax and double dragons. I helped with the programming and design of the game. Two of our programmers where not familiar with the Unity game engine so Victor and I helped guide them through it, but I was pleasantly surprised with how quickly they learned to use Unity. At the end of the event our game wasn’t quite what we set out to make but we are happy with it, although I did hear some of the others say they wanted to work on it more so who knows? Small update to the site, I have added images to both the Writing and Game Projects sections of the site. For the Writing section I have added an image relating to what I had written about and for the Game Project section I added screen caps of the games. I have a new banner picture! So Why does it have two pictures of me? Those that know me know that I often grow out a beard (usually because I forget to shave) and keep it grown out like that for long periods of time. But I also shave the beard off at the drop of a hat. So when people see me it is a bit of a coin toss whether or not I will have a beard, hence the double portrait. Work on the site continues! Nothing of note posted yet but work is going on behind the scenes and should be ready soon. More updates to the Game Projects page with better descriptions for most of the games. Also I took a bunch of pictures to be used for the website. Both with and without my beard. Look forward to seeing those. Front page: I need two main things here, First is an about me statement and second is a picture of me. The site is supposed to be about me and has no picture of me? How did I miss that? getting screenshots for all of my videos and better descriptions about the design process for each game. Changing the layouts of the animation and art pages. New layout of my writings with small exerts from each. Overhaul of my linkedin profile. And finally I need to do more tweeting about my work (and in general really).